More world records than kids have ever seen! 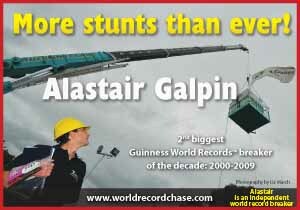 World records in action by the 2nd biggest Guinness World Records™ breaker of the decade: 2000-2009. I can bring world records and the efforts behind them to life, through storytelling. With many world records already accredited to me, and various ones in the offing, I provide storytelling sessions to groups and schools. 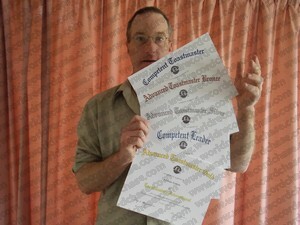 These outline my achievements, providing stories behind record attempts and linking them with live activities. The result is an interactive, feature-rich experience for those involved. Storytelling builds on the traditional method of passing down stories and teaching about events. It encourages people to emulate their predecessors. It also uses imagery, oral and real life events to promote excellence and achievement, whilst providing valuable lessons about challenges involved in taking part in stunts. See this performance live in schools for 11-12 year olds, designed to encourage children to be their best. Forty-five minutes of interactive encouragement using multimedia, on-stage stunts and presenting is used to spread this positive message. In fact, I’d love it if children became so inspired that they applied a world record angle to their next school project. Delivery of these storytelling sessions includes educational messages about goal-setting and innovation, attitude and confidence, plus perseverance and excellence. Whether children dream of becoming athletes, rugby players or accountants, they will need to develop these competencies. Once children believe that they can be anything they put their mind to - world record-breakers included - they can truly soar. These messages are given in between a Q&A session, showing a memorabilia collection, mock world record attempts, and explaining how to get started. You can get an idea of my style of storytelling and making world records appealing by reading some of the stories behind my existing world records. Audience-inclusive world record challenges include the Largest Simultaneous Standing Jump, the Fastest Drumming and the Most High Fives in a Minute. Those who're chosen to write down their world record ideas during the show will have their dreams given directly to staff. Staff on call (ideal group size is 200 - 300). A stage/appearance space width of 8 metres and open walking area to the front. 5 metres of tables to be positioned as needed. An eager student as a helper (if audience does not volunteer). A screen display surface of 8 metres in diameter (ideal; 3 metres minimum). A wide variety of demonstration items to be accumulated by the venue. Variable lighting as needed. Sound capability for multimedia. A microphone (a cordless headset is best). An I.T. technician with equipment on standby. Ready data projector. Laptop with the following minimum specifications: Microsoft Office with PowerPoint (XP or Windows 7), 4GB RAM, 2.30GHz processor, USB ports and DVD drive. WorldRecordChase.com is also able to visit small classes on a very casual basis, holding a straightforward oral Q&A session. This provides a more personal and relaxed interaction without any technology or props. This option is for the likes of tiny bush schools, mountain classrooms, low-key school camps and remote teaching outposts in the developing world. Cost: US$50 inclusive (cash on delivery) plus all transport between the venue and a main traffic route. If you are very remote, you may need to accommodate me too! Note: this option is especially designed to allow teachers without access to 21st century technology have me visit their students. 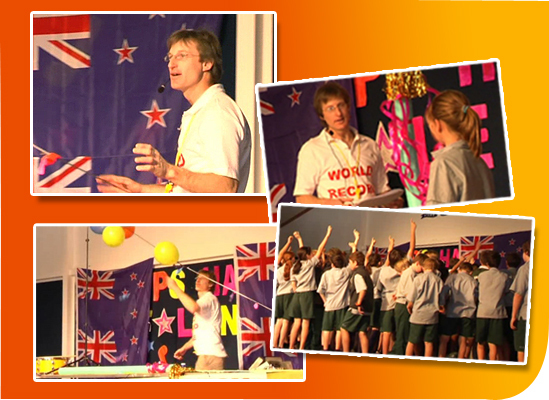 Appearing in front of audiences is nothing new to Alastair Galpin, with his experience of taking part in television programmes around the world, breaking world records. We have thought of some sample sharp-witted entertainment and television programme ideas which can easily be made into top TV programmes, ready to go with the quirky host included!